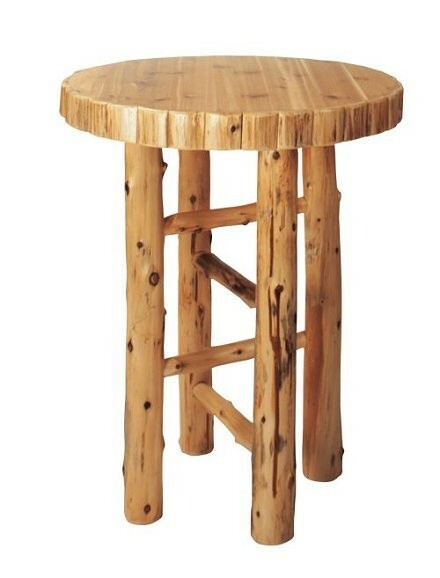 Add this rustic Round Log Pub Table to your bar room to create a lodge look in your rustic home. This log pub table is individually hand crafted and made of hand peeled white cedar logs to give it a natural rugged look. 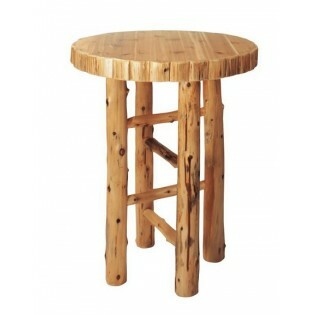 Add this rustic Round Log Pub Table to your bar room to create a lodge look in your rustic home. This log pub table is individually hand crafted and made of hand peeled white cedar logs to give it a natural rugged look. It is clear coated with a catalyzed lacquer finish for extra durability. Liquid Glass Finish is an upgrade finish that is made from a two part epoxy. It leaves a high gloss sheen. It is equivalent to 50 coats of polyurethane. Objects left on the surface for a period of time may leave impressions, these will usually disappear in a few hours at room temptures. Liquid Glass is tough, yet flexible, this characteristic coupled with outstanding moisture resistance, makes liquid glass an ideal coating. Pledge furniture polish will prolong the life of the surface and clean smudges. Light surface scratches will appear with use over time. Liquid Glass may be reapplied to make the surface look brand new.